To live into the Kingdom we need to be able to see differently, through Jesus' eyes. If we can't imagine that our lives and the world can be different, we can't live differently. Living a Gospel-based life is not just about avoiding bad actions, but pursuing good ones that fit in with Jesus vision for the way the world should be. These actions can be on small or large scales, but it's all about asking, "What would God want me to do?" As Christians, we need to build in ways to develop our Christian imagination. See the "Kindling our Imagination" section on the public page. If the 1.2 billion Catholics in the world really saw the world through Jesus eyes and acted on that vision, how would the world look different? Or all 2.2 billion Christians? There is a difference between just belonging to the Church and living our faith as a whole way of life. The whole sense of Jesus helping us break out of our normal way of thinking can be challenging, but also exciting and intriguing for skeptics. The core question: what difference does this make in my life? Stories of Jesus feeding the multitudes with multiplied loaves and fishes are so important that they appear in all four gospels, and twice in Mark and Matthew! These stories show the vision of the Kingdom being put into practice, on earth as it is in heaven. God's Kingdom solution uses people to perform a miracle. "Give them some food yourselves," Jesus says. He could have rained food down from heaven or just made it appear, but he chose to work through human-provided gifts. How does God want to use us to build the Kingdom today? God's Kingdom solution is an unexpected "third way." Across the accounts, the disciples can only imagine sending the people home or buying food from the closest village. But, as is typical of Jesus and the Kingdom, the answer is an alternative beyond their imagination. 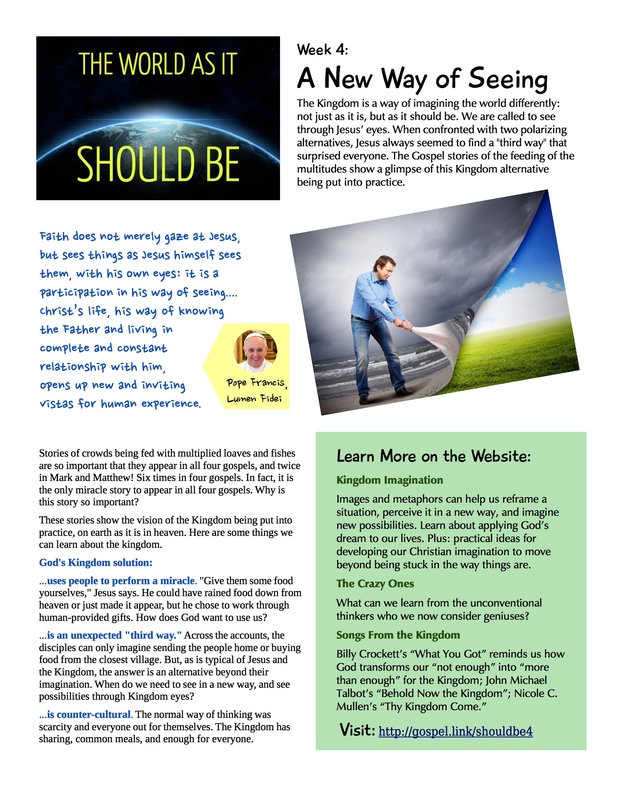 When do we need to see in a new way, and see possibilities through Kingdom eyes? God's Kingdom solution is counter-cultural. The normal way of thinking was scarcity and everyone out for themselves. The Kingdom has sharing, common meals, and enough for everyone.